So how did it all go on the big day? Any conclusions? Final words? Advice. The 7 hour practical exam was the 18th of June, 2015. I didn’t sleep much at all the night before. I arrived 6:45am and I was surprised to see my colleagues already in the parking lot. We were all anxious. We arrived in civilian clothes (you must) and changed rapidly in the women’s locker room. I brought my own KitchenAid even though new Kenwood machines had arrived a week earlier. I’m familiar with my machine, it gave me just that little more security I needed. The examinators were made up of: Three male judges combined of patissiers and ex-professeurs who observe, take notes and are even there if you need some assistance. Sometime during the exam they will ask you to stop work when it suits you to take out 15 minutes to ask you a series of food technology questions related to your recipes. A fourth member of the jury was a woman from the department of health and sanitary or something to that extent. She asks the questions on bacteriology, toxicology, hygiene, good work practices and some food technology. Her questioning is 15 minutes also. Then there was our Chef. He was there simply to assist, for example we need something washed he’d be our dishman, or if we needed an ingredient. Having chef there was comforting. Familiarity on the day helps. 7:30am we start the theory in another room (not lab). We have 30 minutes to complete the organigram. It’s during this time we find out the theme for our patisserie. It’s Route du Rhum. Note: before the exam, months before you know the three possible themes, for 2015, we knew it to be either: Route du Rhum, Fetes des Meres (Mother’s Day) or Haute Couture (high fashion). For example, my friends who had exams on other days, they had any one of these three. We did not all have Route du Rhum. Also, you know in advance there will be 4 things to make in the categories of: Pate a choux, Viennoserie (anything with yeast), a tart and an entremet. 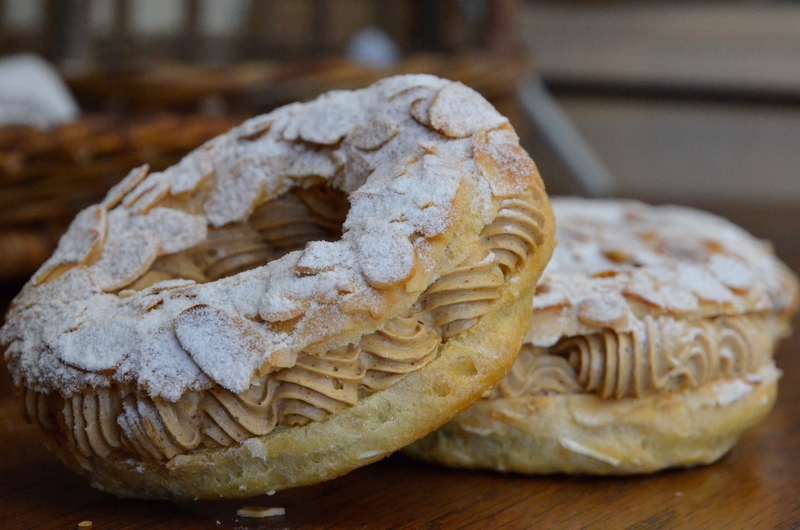 So for pate a choux, you don’t know if you’ll have eclairs, religious or paris-brest. You just don’t know until the day. Same for viennoserie, you may get croissants or brioche. It’s a surprise! By 8ish-8:30am you begin in the lab. The organigram completed earlier is photocopied by the judges. They have a copy to mark and you have a copy to follow your production, because that’s what the organigram is for, it’s a method or your organisation of all your recipes. It’s against exam rules to take photos. Yet one guy took photos anyway in secret and almost got himself kicked out of the exam. So I’ve re-made my exam (the 4 photos below), it’s as close as I could get it. I think my work was actually better on exam day. Amazing what pressure and stress does. Tarte: Tarte chocolat banane. 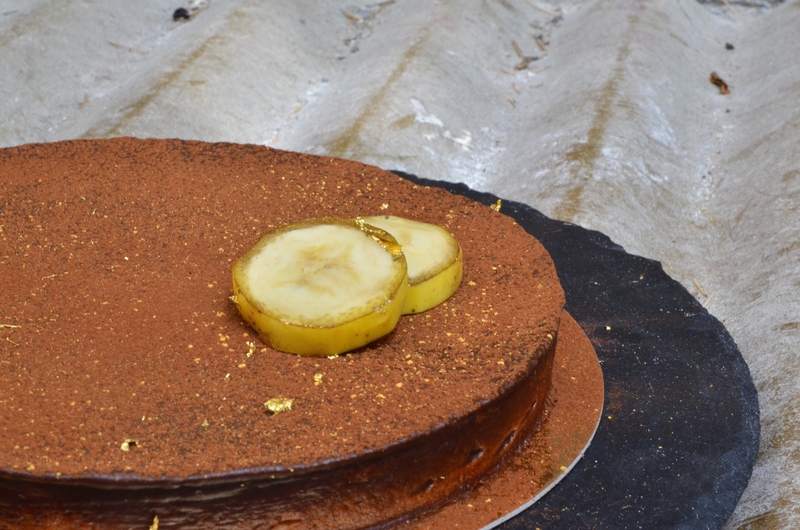 I went really simple with my tart by powdering cacao powder over the ganache, feathering over gold powder and leaves of gold over the tart and on the two slices of banana. 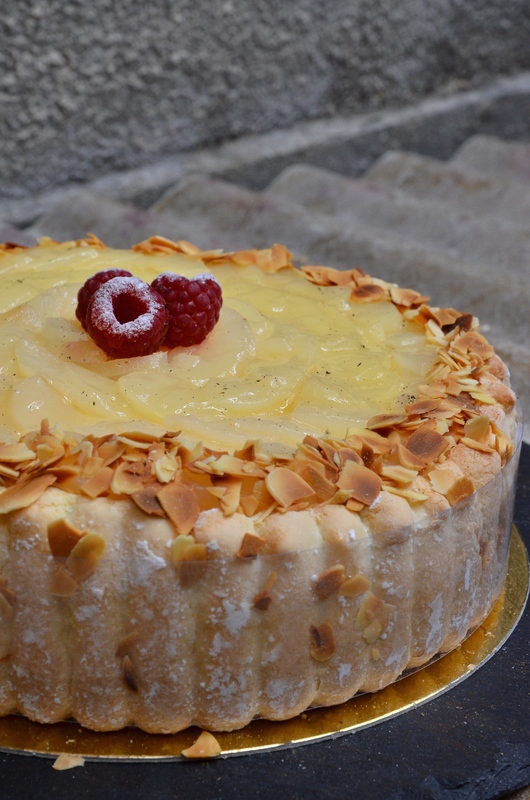 Entremet: Charlotte aux Poires et Framboises. For the exam I placed a plaque in pate d’amande in the shape of a scroll and in chocolate I wrote Route du Rhum. My fellow colleagues made a lot of fuss over their patisserie. I explain: tempering chocolate to make chocolate decorations, piping elaborate fancy whipped cream decorations which were not done well. I chose not to do this because I did not think it’s wise as it’s time consuming and if not done right it’s a disaster. You don’t need to do fancy elaborate decor to get more points, it’s not what the judges are looking for. I have to say when looking at the work of my fellow colleagues I would have advised them also NOT to do it. The judges want something that they can see in the “vitrine”, in the display cabinet of a pastry shop. So it’s important to stay exactly to the theme, simple and beautiful if you can. If you try to venture off into the world of “Michalak” creativity you must be sure that when you execute you do it well, 100%! And remembering, the CAP is not a competition. I found also that my fellow candidates rushed through the recipes with the goal to get to their decorations . So what happened? When you rush the basics or the foundations of patisserie it will be obvious in the end result. For example, I saw brioches of my fellow candidates in all shapes except what was asked for, for a couple of candidates their brioche dough didn’t even rise. For the entremet, I saw whipped cream over whipped into what looked like lumpy ricotta cheese. One candidate her Charlotte looked more like a Saint-Honore because of the Saint-Honore cream piping. I also saw chocolate decorations gone wrong and then covered up with some other horrid decoration. Tart bases burnt, too thick. One candidate, her chocolate tart was decorated with a chocolate sail like to resemble a catamaran but the end result looked like a shark fin and the judges in fact commented on that. 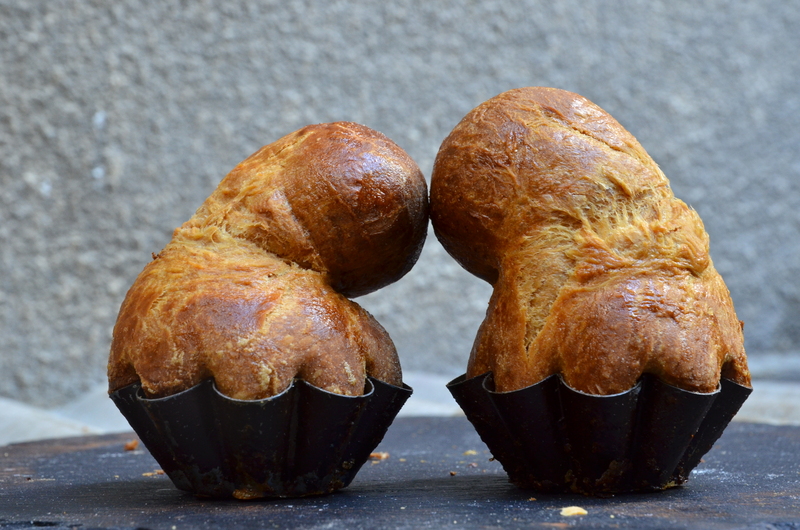 The CAP are traditional recipes and are the basics of patisserie. If you are supposed to make a Charlotte, make sure your entremet looks like a Charlotte and not a Saint-Honoré. My colleagues took vacations while I was studying. I simply couldn’t have this luxury when I have trouble with the French language. I studied my theory and French. I practiced the practical at work whenever the lab was available to me. I had aching feet and my brain felt as it was going to explode. Imagine all the translating I have to do just to understand one paragraph. Lots of tears, lots of worry came along with lots of work. I was sure I’d have to repeat the CAP the following year. I passed the 7 hour practical. In fact, I got the highest mark!!! Imagine, I’m not even French. As for you, if you are in the year to do your CAP I wish you all the best of luck. If you are going in as a Candidat Libre I advise you to know the kitchen/lab where you’ll be doing your exam. I’m sure if you ask the school and the Chef they will be more than happy for you to familiarise yourself with the lab. The more efficient you are moving around the lab, the more efficient you’ll be in your exam and keep to time. Also, last advice. Be super nice, patient and calm with the examiners. Don’t be annoyed with them even if they are starring at you and your work and asking you bullet questions. A couple of colleagues in the exam reacted in an offended way against the examiners. Also, don’t talk to your fellow candidates!!!!! Ask the examiner to hand you something if you can’t reach for something. And do not, do NOT take photos!!!! One guy was sneaking taking photos and he was caught! Not sure what happened after that, but it did not go well for him. Okay. The examiners are there to get you through. They are not there to fail you. They understand it’s nerve racking for students so they try to stay back a little, let you do your work. Then they ask, “are you ready for some questions?”. If you are not, you just ask, “Can I have just 5 minutes, I finish what I’m doing here (maybe you need to put something in the oven)”, and that’s okay. Bon, send me an email at gabriella@pirisi.com if you have any questions regarding exam day or preparation, I’ll try to best advise on the experience I had. Excellent advice on how to approach these things. And well done!